Another common form of emission is synchrotron radiation. This occurs when an electron moves very close to the speed of light in the presence of a strong magnetic field. The magnetic field will cause the electron to feel a force and to change direction. The electron is being accelerated and it emits radiation. Due to the fact that it is moving close to the speed of light, it focuses the radiation towards the direction that it is travelling and will emit mainly at one frequency. In astronomical sources of synchrotron emission, we see the summed emission from many electrons with different speeds and moving in different directions. The summed emission of all these individual electrons produces waves with a continuous range of frequencies, known as a continuum. Synchrotron emission does not depend simply on temperature, and it is a case of non-thermal emission. Synchrotron radiation traces regions with fast-moving electrons and strong magnetic fields, typical of regions where shocks are occurring. Examples of such regions are the supernovae remnants as well as jets produced by neutron stars and black holes, and synchrotron radiation can give information on the energy contained in these regions as well as the strength of the magnetic fields. Below is a radio map of the centre of the star-forming galaxy M82, which shows two components of synchrotron emission: a diffuse component (the extended red and orange emission) as well as compact emission from individual radio supernovae and supernovae remnants (the bright spots). Image credit: T.W.B. Muxlow, A. Pedlar, E.M. Sanders. 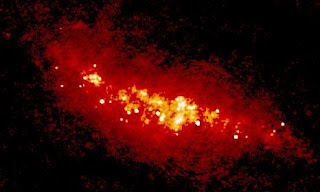 The second image is a composite of the radio galaxy PKS 2356-61. An optical image, in blue and a radio map in red are shown superimposed. The optical emission shows the stellar light, while the radio emission reveals the synchrotron emission from the lobes of a jet emanating from a supermassive black hole. Image credit: A. Koekemoer, R. Schillizi, G. Bicknell and R. Ekers.